Science writers get into the game with all kinds of noble, high-minded ambitions. We want to educate. To enlighten,â notes guest editor Amy Stewart in her introduction to The Best American Science and Nature Writing 2016. âBut at the end of the day, weâre all writers . . . Weâre here to play for the folks.â The writers in this anthology brought us the yearâs highest notes in the genre. 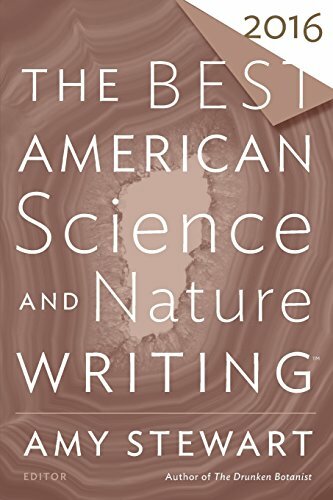 From a Pulitzer Prizeâwinning essay on the earthquake that could decimate the Pacific Northwest to the astonishing work of investigative journalism that transformed the nail salon industry, this is a collection of hard-hitting and beautifully composed writing on the wonders, dangers, and oddities of scientific innovation and our natural world. Amy Stewart, guest editor, is the award-winning author of seven books, including her acclaimed Kopp Sisters novels and the bestsellers The Drunken Botanist and Wicked Plants. She and her husband live in Eureka, California, where they own a bookstore called Eureka Books. Tim Folger, series editor, is a contributing editor at Discover and writes about science for several magazines. He lives in Gallup, New Mexico. About: Science writers get into the game with all kinds of noble, high-minded ambitions.